In my Bake for the Memories post, I mentioned our rugelach and how proud we were that our favorite baker awarded these tasty gems her esteemed stamp of approval as equaling, or perhaps even besting her best effort. So now I share with you our journey over the last few days of making 16 dozen rugelach – 1/2 to gobble up now, share with friends and enjoy at our family’s late-arriving Hannukah party this coming Saturday night. The other half is in the freezer, awaiting my daughter’s upcoming Bat Mitzvah. 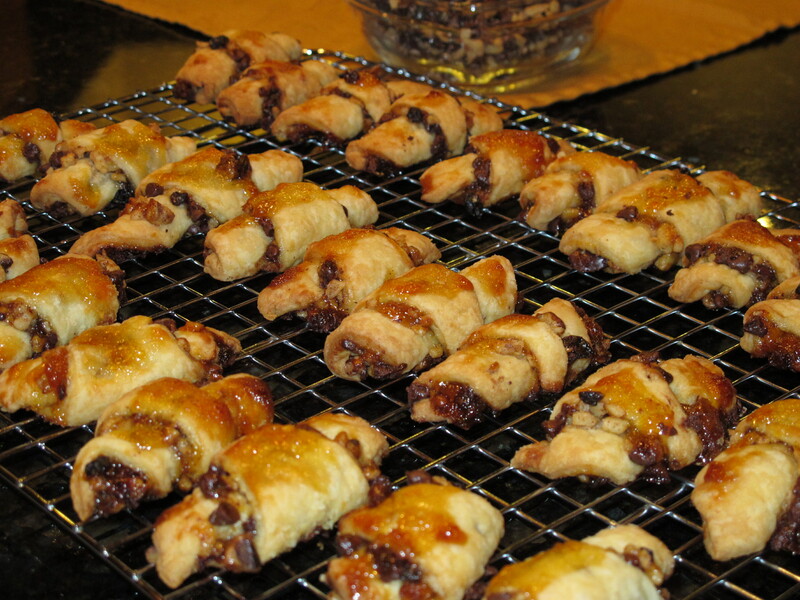 Rugelach is a traditional Jewish pastry with a rich butter, cream cheese, and in this case sour cream dough filled with a mixture of nuts, currants, chocolate, and cinnamon sugar. Besides the chocolate, the other fabulous part of this recipe is the apricot jam that lines the dough and tops it after they are rolled into crescent-shaped beauties. I originally found this recipe in Food and Wine magazine (here goes the age give-away) from December 1990. It was an article about Hannukah by Susan Shapiro Jaslove. This is a wonderful recipe from Susan Shapiro Jaslove’s family that we really have found no reason to modify. But I have compiled some tips for easier prep over the years. As my daughter said yesterday when I complained that I’d only had one and they were almost gone: “You have to be aggressive, Mom, if you want to eat rugelach.” They are really yummy and will disappear fast so enjoy every bite, but do it quickly! In a large bowl, beat the butter and cream cheese with an electric mixer on high speed until soft and creamy, about 1 minute. 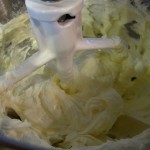 Mix in the sour cream and 2 tblsps of the sugar until well combined, about 1 minute. Stir in the flour by hand until well blended. (I use the mixer to fold in the flour but it can get messy so be careful.) Put the dough on your work surface (could just be parchment) and separate out into four equal pieces (eyeball it or use a scale) Wrap each piece in plastic wrap and refrigerate for at least 2 hours, overnight, or even a few days. Or freeze. Preheat the oven to 350 degrees. Remove one dough ball from the refrigerator. On a lightly floured surface, form the dough into a ball and flatten it out. Roll the dough into a circle about 10 inches in diameter and 1/8 inch thick. 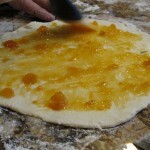 Brush 2 tblsps of the apricot preserves over the dough. (If the preserves are bit thick, add a bit of water, heat just a bit in the microwave and mix well to loosen them up) Sprinkle 2/3 cup of the chocolate mixture evenly over the dough and press down gently. Cut the dough into 12 triangles using a pizza cutter. Starting with the first triangle, roll the dough tightly, but carefully, from the wide end toward the point. Roll tightly but gently at the same time. Place the rugelach, with the pointed side underneath, on a large ungreased cookie sheet lined with parchment paper. Roll up the remaining triangles in the same manner and arrange them on the sheet, about ½ inch apart. Repeat with the remaining dough, preserves and chocolate mixture; the rugelach will fit on 2 large cookie sheets. 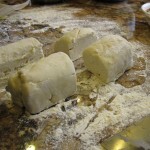 Make the dough the day before, cut each single recipe of dough into 4 pieces, wrap, and refrigerate overnight. When rolling out the dough, only take one piece out of the refrigerator at a time. If possible, roll out on marble or granite and use a marble rolling pin or a cold rolling pin. If you are working in a team of two or more (recommended but not required) you can try to roll out two dough rounds at a time. But don’t try this the first time – wait until you are used to handling this very rich, melty dough. 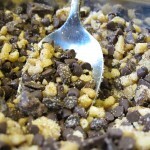 To save time, buy mini semi-sweet chocolate chips – eliminates the time and mess of chopping chocolate. Do the same with walnuts – buy them already chopped. 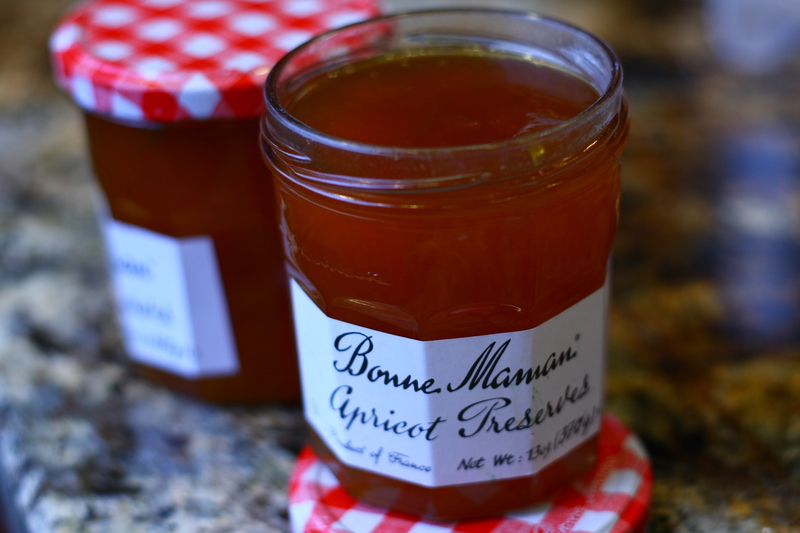 Buy good quality apricot preserves – they taste great and spread the easiest. Use a pizza cutter to cut the dough circles into the 12 pie-shaped pieces for rolling. 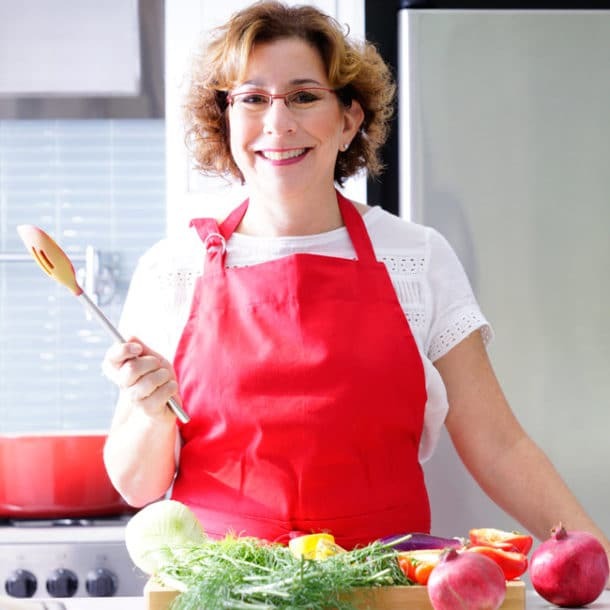 Just use regular unsalted butter – don’t use the fancier butters that are available at gourmet stores – the fat content is different and the dough doesn’t come out right. We learned that the hard way. These freeze really well. So don’t hesitate to double the dough recipe and make extra. Bake on parchment or silicone mats. So much easier when they come out of the oven. I’ve never even heard of Rugelach, but you had me at “chocolate & walnuts”! I’ve only ever used nuts and cinnamon sugar as my filling but chocolate would be really tasty. That looks like a lot of hard work, but ooohhhhh soooo YUM! Hi! Love the detailed instructions – will be making this recipe this week! Do you freeze them before they are baked or after? Thanks for stopping by my blog. So glad you enjoyed the rugelach post. Please let me know how yours turn out. I’ve never frozen them before I baked them. Thinking through it, it might be an option, though I wouldn’t put the jam on until you actually bake them. But my experience has been freezing them after you bake them. And they have always been excellent. They really don’t degrade at all from freezing. I just layer them with wax paper in a tupperware and then take them out the day that I want to serve them. Nobody ever knows the difference. Another option — you could probably freeze just the dough for a few weeks, defrost, and then make them, similar to what you can do with pie dough. Enjoy and stop back again soon. Okay so your blog name is perfect because all I want to say to this post is OMG yummy! 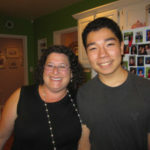 OMG I am SO glad you visited my blog on my SITS day so that I in-turn discovered YOUR blog. My fiance was so excited when I shared this post with him. 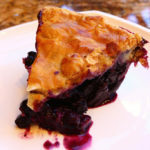 Great post, great recipe – can’t wait to try! 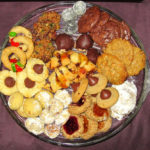 The judge was my friend’s mom (you can read it about it here http://omgyummy.wordpress.com/2010/12/03/bake-for-the-memories/) but I would love for you to make them and judge for yourself. Let me know what you think. I would welcome another judgement day from my readers! They look amazing. I am off to Houston next month for my future daughter-in-law’s shower, may have to bring these! Hi Irene – they would be perfect! You can make them ahead, freeze them, and package them easily for travel. What an exciting time for you – enjoy the shower! omg, this looks so wonderful! I loved the pictures! I wish I had your kitchen countertops! 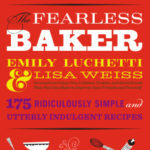 I am definitely going to try making this next time I try to make Rugelach. We love our countertops too — thanks for noticing :-). 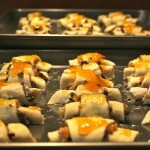 Rugelach are labor intensive but not hard if you are organized and they are so worth the effort. I noticed you used a different method to make them – rolling a rectangle of dough, filling, and rolling and cutting like a cinnamon roll. We are going to try that next time too to see if it speeds things up or improves the process! There’s always more to learn! 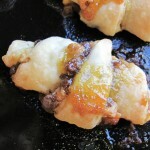 I LOVE rugelach but always thought they looked too difficult to attempt at home. Your recipe doesn’t seem too difficult, though! It’s not too hard and it’s well worth the effort. Give them a try and let me know how it goes! You beat me to it! I was about to write this note and then I saw your comment in my blog. Rugelachs have been on my never-ending to-bake-list. Have you had the chocolate covered cherry rugelachs from Noe Valley Bakery? I love those! And yours look sooooo good, I want some now! Thank you for sharing the recipe. I’m glad you included the photos!! Thanks for stopping by Jun! Next visit to my niece in the city will have to include a trip to Noe Valley. 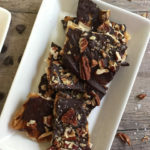 We haven’t had their rugelach but they sound very intriguing – can’t imagine the chocolate-covered step – that must be interesting to make but oh so yummy to eat. Give rugelach-baking a try – they are labor-intensive but because the recipe doubles well, they freeze so well, and really they are so scrumptious from breakfast all the way to dessert, that I think they are really worth the effort. Oh My God Yummy, Yummy, Yummy. Save some for Papa and me. Bringing several dozen to the Hannukah Bash Saturday night. Never fear. We may be out in our house but the freezer is full!